Congratulations and thank you to all of our riders that participated in the NCH 2016 Horse Show Series! We had a very successful season and we hope every rider that participated in the shows will join us on Sunday, October 23 for our Awards Dinner! There will be awards and recognition for all riders! Reservation forms available on Facebook, in the office or via email. Please return forms with payment by October 17th. Additional forms are available in the lounge. As most of you have seen in the past week, LOTS of construction projects are going on at the farm! The viewing lounge will be a warm and comfortable place to watch your rider. Please be patient while we get cleaned out and reorganized, it will take a few weeks! The tack room is also being reorganized. All unlabeled and unclaimed tack and tack boxes will not be returned into the tack room. Only current riders/boarders and lessors will have a space for their riding gear. Fall Fun Days are coming!! Monday, October 10 and Friday, November 11, 10-3pm. Sign up today!!! A great way to have your rider to have some fun and get some extra riding time! NCH Pre school program has started! It's not too late to sign up for the remaining weeks! Click the link below to sign up! NCH is working on a new lesson program, to offer more group lesson options and add more lesson times! We are fortunate to have such a full schedule for our 4 trainers. Some of you are starting to see some new faces around the farm. Kait, Nicole and Jill have joined us int he growth and reorganization of NCH! NO shavings in the wash stalls. The drains have been cleaned out and ALL riders MUST sweep out all the debris after each use. Please help us in making sure your rider has cleaned up after themselves!!! **A chore chart is being made for riders that don't clean up after themselves or leave their horses tack out. Riders are to arrive at least 15 minutes prior to lesson time for grooming and tacking up. Late arrivals will result in a shorter lesson time. Please respect the 24 hour cancellation policy. Horse assignments for lessons are made at the start of each week. Lesson packages are to be paid prior to the start of the lessons in order to receive the discount. Late fees will be applied to unpaid lessons. NCH accepts cash, checks and credit cards for your convenience. Or you can request invoices sent via Square by email and pay from your home computer. See you all at the Awards Dinner on the 23rd!!! NCH had another busy summer!! As we say goodbye to our summer campers, college students, and summer riders, we move onto a busy fall! Everyone had a great time on the trip to ADK Extreme!!! This Saturday is the RUN FOR THE HORSES 5K at the Orenda Spring in the Saratoga Spa State Park. We will have some of our thoroughbreds participating again this year. It's not too late to sign up, please consider registering for this great cause!! The fall schedule is almost full, very few spots are left! Please make sure you have confirmed your rider's day/time and start date. Lessons will continue to be given 7 days a week. Group lessons available, please ask your trainer if you are ready to ride in a group! Being in a group lesson gives your more ride time! Please note that Tiny Trotters and very beginner riders are unable to ride in a group. *Please note: Lesson students that have a standing day/time each week are expected to attend EVERY week. Riders that miss more than 2/5 lessons may lose their lesson time and have to be on a week by week basis. Last month we welcomed Kait to the NCH family. She will be handling many of the barn tasks, taking care of horses, and teaching lessons! We are in the process of hiring a 4th trainer. Horse request forms must be submitted before September 18. Available in the office, please fill out BOTH sides. Show prep will be 10-2 on 9/24 for ALL riders to help in getting the farm, horses and tack ready for show day!! ALL lessons must be paid for prior to or at the time of the lesson. Unpaid lessons will result in late fees. NCH accepts cash, checks and credit cards for your convenience. Payments are to be put into the secure lock box in the office. You can request invoices sent via Square or keep a credit card on file. *ALL shows (except NCH) require a non-refundable $50 deposit toward entry fees. Please email Amanda if you are interested in any of these shows. *Ribbons from the last NCH show are in the office. ****August 21 at 1:00 NCH is heading to Adirondack Extreme for a fun afternoon! Riders 10 and over, along with their parents are invited, $35 per person. This is about a 4 hour course. ALL money is due by August 15th, cash or check only. Lesson packages are to be paid prior to the start of the lessons in order to receive the discount. Late fees will be applied to unpaid lessons. NCH accepts cash, checks and credit cards for payment. Or you can request invoices sent via Square by email and pay from your home computer. **Wash stalls to are to swept after each lesson, along with all tack put away. Lessons are to be scheduled and canceled with Allie to avoid being charged, a 24 hour cancellation notice is required. Vet and Farrier bills are posted on the office board, please make sure to check this board regularly. Fall schedule time! Please let me know if you will need a different day or time once school starts! Please be sure to let me know your last lesson date! Congratulations to Julia on her new full time job!! She will still be teaching on Friday evenings and Saturdays! Amanda, Ashley and Sera will be taking over for the other 4 days of lessons. July 17 is the next NCH Series Show, horse request/entry forms are due by July 8th. Please make sure to fill out BOTH sides! *Please remember that ANY rider under age 18 is NOT allowed to be at the barn to ride without a parent/adult on the property. NCH staff cannot be responsible for boarder/lease riders supervision. Congratulations to the riders that traveled to Syracuse last weekend for a great show!!! *A deposit is required for entries to the above shows. Please let Amanda know if you would like to go. *Do not sponge or bath horses in the wash stalls! All should be done out on the rocks/shale on the side of the barn to avoid mud. This Sunday is the 2nd in the NCH Horse Show Series! The next home show is July 17, followed by September 25. Series awards party date tba. NCH riders are competing in the TUFF ENUFF mud run tomorrow, more teammates are welcome!! Online sign up is closed but you can sign up in person!!! Lots of fun and a great fundraiser for the Saratoga Prevention Council. *All lessons must be scheduled and canceled with Allie to avoid being charged. 24 hour cancellation notice is required. *NCH Camp Out!! Saturday, June 11 at 5:30pm. This camp out if for all riders, ages 10 and up. Bring your tent for BBQ and s'mores by the fire and a fun night at the farm! *Lunge clinic on Sunday, June 12 at 10-11:30 for ages 10 years and up. This clinic is limited to 8 riders at the cost of a regular lesson. Sign up on the board! Lessons will continue to be held 7 days a week, Tuesday openings are available. Please let me know if you are interested in changing days/times for the summer when school gets out. During July and August, lessons will start at 2:00 on weekdays, while summer camp in in session. Friday morning lessons may be available to boarders, please let me know if you are interested. **PLEASE DO NOT PARK DIRECTLY IN FRONT OF THE BARN. It's hay season and the wagons will be rolling in daily to unload. Parking is along the fence and driveway only. Do not block the road going along with left side of the barn. Riders must arrive at least 15 minutes prior to lesson time. Please check the board for your horse and retrieve your tack upon arrival. Check boards for all bills and upcoming sign up sheets. Please pay on time to avoid late fees. Riders under 17 years are NOT allowed to be at the barn riding without a parent on the property. NCH staff cannot be responsible to supervise riders. Congratulations to all of our riders on a fantastic horse show on Sunday!! The weather wasn't perfect, but everyone did such a great job!! The results are below. A huge thank you to all the parents and family members that worked so hard to make the show a success and stayed to support their riders! NCH is so appreciative for all the great support from a great team of families! A huge shout out to Mandy for the amazing food!!! Next NCH show is Sunday, June 5. Horse request and entry forms are due by May 22. No lessons or lease rides June 4-6. The following NCH show dates are July 17 and September 25. Please make sure you have sent your RSVP to Amanda for the May 14 trail ride to support St. Jude's. You will need to set up your fundraising page to participate in this event. *Sunday, May 15 at 11:00 will be an in hand, horsemanship and show prep clinic. This clinic will include braiding, clipping, grooming, pattern practice and in hand tips. This clinic will count as a lesson. Summer camp registration forms are online at summercamp.nch@gmail.com Pony Pals camps are full and so is session 1. Tuesday lessons will be offered starting June 7. Please contact me if you are interested in switching to a Tuesday lesson time. **Please let Amanda know via email if you are interested in going to any of the above horse shows. -EVERY rider is required to show up at least 15 minutes prior to lesson time for grooming and tacking up. Riders are to take out their tack, help to retrieve, groom and put away horse and tack for every lesson. Riders are also required to sweep their wash stall after use. Happy Riding and Happy Mother's Day to all the great barn Moms!!!! Another busy month of activities at NCH!! ***Important reminder: ALL outstanding horse show, lesson, lease and board bills must be paid up to date. As of April 4, any outstanding bills will have a 20% late fee added. Square invoices will be sent, please pay ASAP. Your attention to paying on time is greatly appreciated. DATE CHANGE: The NCH Tack Sale and Open House will be held on Saturday, April 30th from 10-2. Summer camp, lessons, horse shows, and IEA Team information and sign ups will be available. Along with a used tack and clothing sale. The summer camp/lesson starter outfit will also be available for purchase, and order. This set includes helmet, riding pants, gloves and boots! 2016 Horse show dates and sign ups will be available. Please let Amanda know if there are any shows you would like to attend this year. TCRA forms are available in the office. *Riders participating in the May 1 show will be getting the horses and farm "show ready" on 4/30. *Volunteers are needed for show day, please let me know if you are willing to help out. Volunteers help keep the cost of running the show down. May 1 NCH Horse Show: This is a great opportunity for riders of all ages and abilities to participate. Horse request and entry forms are in the office, please ask your trainer to help assist you in filling them out. Forms must be filled out before April 24. Trainers have a tough job of organizing all the riders with their requested horses. **NCH show dates, May 1, June 5, July 17 and September 25 * an end of the year awards party to be held in October!! *Riders returning after the winter must have at least 5 lessons prior to participating in a NCH horse show. April school vacation is coming, please let us know if you are interested in sending your rider to a few days of camp to be held the week of April 25-29. suggestion welcome! Or a great opportunity to add an extra lesson or two before the horse show. NCH welcomed a few new horses this week! Squishy, who is about to have a baby!!! Also, Marvelous, Sonny and Spud. Look for new lesson horses be added to the schedule soon!!! Spring Preschool Program will start May 3. This 8 week program will be held on Tuesdays, from 11-12:30 for 3-6 year olds. This is a great opportunity for an introduction to safety, pony grooming, beginner riding skills along with a craft (time permitting). $80 per child for the 8 week session. Lessons will continue to be taught 7 days a week at NCH. The IEA Team holds practice every Saturday from 3-5, so lessons are not scheduled on Saturday afternoons. We have a few available spots in the spring schedule! We are looking for adult riders to hold an adult riding lesson on Fridays, late mornings or early afternoons! Please let me know if you are interested and your availability. -it is the responsibility of ALL riders to return their tack, clean their wash stall, keep the barn and tack room clean and organized. Happy March! Spring is a couple weeks away, and NCH has lots going on! -Clothing/tack sale, summer camp registration, horse show information/sign up, lesson program and IEA Team information day! This is a great opportunity for current and new riders interested in finding out or signing up for all the events that happen at NCH. Clothing orders for NCH logo wear will also be taken. All returning riders can update their releases also. **Save the dates! Theses shows are open to riders of ALL ages and abilities with at least 5 lessons at NCH prior to the show date. Horse request forms will be available at the open house and in the office, due April 24, no exceptions! Horses are assigned by the trainers, on a first come, best compatibility basis. The home shows are a perfect opportunity to introduce new riders to horse shows. Volunteers will be needed to help out, please consider volunteering your time to help make the show run smooth, while helping to keep costs down! *NCH show series leads up to a year end awards party, lots of great awards for all riders! 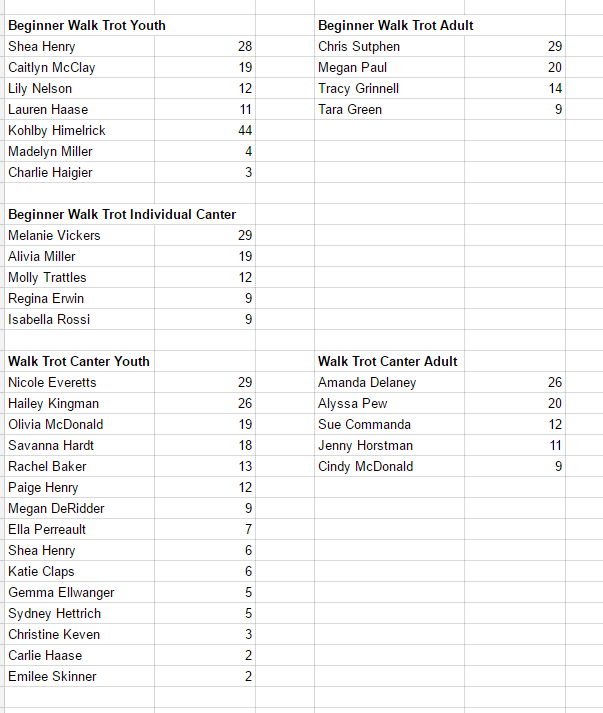 NCH will also be participating in TCRA shows, please make sure you have signed up for TCRA to have your points counted. Forms available in the office under the payment box. TCRA show dates and information will be available at the open house. NCH IEA Teams are heading into post season competition, congratulations to all our team riders on a successful season! Good luck in Skaneateles on March 12-13! Riders can move onto Zones at State College, PA on April 1-2, and onto Nationals at the Kentucky Horse Park, April 19-24! GO TEAM!!! Spring schedule will be starting in April, new group lessons will be forming. Sunday lessons will continue also. Please let me know if you will be needing a new day/time or are interested in joining a group lesson. Group lessons are the same price in a package, but riders have a longer lesson time. A great opportunity for more riding!!! -please arrive at least 15 minutes prior to your scheduled lesson time for grooming and tacking up. Riders should be checking the board upon arrival for horse assignment, and retrieve all tack, before informing trainer of their arrival. Trainers, riders and barn staff are there to help, please ask if you need help or have any questions. -ALL riders are required to sweep wash stall after every lesson/ride. ALL tack must be returned to tack room after use. -unpaid lessons, lease or board are subject to late fees. Summer camp registration has started, all registration forms can be filled out online at www.ridench.com. Once forms have been submitted, an invoice will be sent for payment. Please remember camp registration is not complete without payment, and completed forms. Pony pals,full week, and advanced camp weeks are back this year! Register today!! WINTER VACATION FUN CAMP * February 16 & 18, 12-3, open to all riders age 7 and up. $40 per day, registration/payment due by February 12. Limit 15 riders. Saturday, February 13 and Sunday, February 14, due to the Daniel Stewart Clinic. Please email/text Allie to reschedule your lesson. *Boarders, please check with Amanda for arena availability. Lease horses will not be available. *Amanda will be available on Sunday, February 21 for make up lessons. Email/text Allie ASAP to secure a lesson time. *School vacation is approaching, please remember to cancel or reschedule your lessons if you will be away. Vacation week is also a great opportunity to add an extra lesson!! Exciting new things coming to NCH!! *NCH Spring Preschool program! This is a weekly program for children 3-6 years, starting May 3. The class will be held on Tuesdays, 11-12:30, the children will learn about safety, grooming, beginner riding skills and do some crafts. $80 per child for 8 weeks. Another session will be offered for 6 weeks in the fall. * Bits and Pieces Tack Shop will be expanding this Spring! More information coming soon! -A beginner rider/camp rider starter set will be offered this Spring. Set includes a helmet, paddock boots, riding jods and riding gloves. Price and order form will be available on the web site soon!!! NCH Summer Camp is looking for a few Counselors in Training this summer! Riders age 15 and older, with valid working papers can apply for a part time position. Resume with cover letter should be submitted to summercamp.nch@gmail.com before March 1. Please include your availability. Jumper jackpot and Game night, ongoing fun during the winter months! 1st and 3rd Fridays. End of season awards!!! The NCH IEA Teams are heading to Regional competition in March, Zones at the beginning of April, and hopefully onto Nationals at the Kentucky Horse Park!!! Congrats to all the riders on a successful season! Open registration for the 2016-2017 season begins in May! Riders in grades 6-12 are eligible to join the team! *All riders are able to participate in NCH home shows, and must have at least 5 lessons prior to the show. A informational meeting will be held prior to show season, date and time TBA soon. An awards party will be held in the fall. Non-NCH show dates will be announced soon! All riders must arrive at least 15 minutes prior to lesson time orse assignments are listed on the board, so riders can retrieve appropriate tack upon arrival. Horses are to be groomed before and after each lesson, and wash stalls must be swept after each use. Riders are expected to put away all tack after their lesson and help put horses away. NCH has a 24 hour cancellation policy. All riders, boarders and lessors should have already filled out their 2016 releases and contracts. If you have not, please remind your trainer ASAP! Lesson payments are due at the time of the lesson, Square invoices will be sent for any lessons, board or leases not paid on time. Late fees will be charged. Please remember to check the board for any vet, farrier or horse show bills. On time payments are appreciated! A calendar is now posted in the barn, please check it for all upcoming events! *An evite, along with a facebook invitation, was sent to all NCH families, and IEA Team members! NCH is having an After the Holidays Bowling Party in the VIP room at the Saratoga Strike Zone, Sunday, January 10 at 4:00pm. Bowling, food and bumper cars are included for NCH in the private VIP room. PLEASE rsvp via evite, facebook or to this email by Tuesday, January 5. The cost is $10-$15 pp, and we need at least 50 participants to rent the space. Riders, along with parents and siblings are invited! Congratulations to Amanda on her purchase of the NCH farm!! It was a long time coming, but she finally owns all property! This just means great new changes and projects to come in 2016!!! On to business....ALL riders/parents must re-sign and date a release for 2016, and new boarding and lease contracts must be filled out. Trainers should be asking you to update paperwork at the next lesson. Please make sure all contact and health care information are correct and up to date. NCH welcomed a new pony this weekend, Mariah will be a new lesson pony!!! Winter has been very good to all of our horses and riders so far this winter, but please remember to dress your riders in warm layers and mud boots for their barn time!! Summer Camp registration has begun!! Registration forms and all information are available at the NCH website, www.ridench.com. Any questions can be emailed tosummercamp.nch@gmail.com. Horse leases are available on a month to month basis, contact Amanda for availability! Show season will be here before we know it! The first NCH show will be held in April. All riders must have at least 5 lessons prior to the first show. Spring schedule will start March 1. Show dates and information will be send out mid February. Both NCH IEA Teams are having a great season! Individual riders, along with the teams have qualified for regionals to be held in March. Hopefully, everyone will qualify for zones in early April, then onto Nationals in Kentucky!!! Congratulations to all of the IEA middle and high school riders!! Keep up the great work!! NCH wishes everyone a happy and healthy 2016!! NCH has lots of fun activities happening in December, and the weather is still cooperating!! December 13 * The IEA team will be hosting a Fun Winter Day from 12-2 for ages 3-6 years! This is a great opportunity for the little ones to have some extra fun with the ponies, a visit from Mrs. Claus and some holiday treats!! Cost is $15 per child. see attachment, RSVP by December 10 Please!! December 20 * NCH 4th annual Deck the Stalls from 12-2. There will be a sign up sheet posted, 20 stalls available to decorate, individual or teams! Hot chocolate and treats too!! ALL riders and siblings are welcome to join us for this fun day! Judging will take place at 2:00. ALL decorations MUST be removed before January 1, some sooner. December 28 * Fun Day * Riders of all ages are welcome to sign up. Sit a buck, egg on a spoon, and gamblers choice! $35, drop off at 11:30, and pick up at 2:30. December 29 * Advanced rider clinic with Amanda. This is a limited clinic to be held in 3 parts from 9:30-3:30, cost $65. The first session will emphasize on position and response in flat work. After lunch (included) riders will have the opportunity to work with some of the NCH green horses, focusing on techniques that will benefit both horse and rider in success. The last section of the day will concentrate on jumping and course work. December 30 * Game Day * Play games with Chelsea, open to all riders. Arrival at 11:30- pick up at 2:30, $35. Ring game, poles and a few other games will be played. Also, during the winter months, NCH hosts weekly game activities! Almost every Tuesday night is Broom Ball!!! Jumper Jackpot is held on the 1st Friday of each month, with fence height starting at ground poles. All riders are invited! GIFT CERTIFICATES FOR LESSONS AND SUMMER CAMP AVAILABLE! The make great stocking stuffers! 5, 10, 15 or 20 lesson packages available. Please note: Some NCH pricing will be going up as of January 1, 2016. ALL riders, boarders and lessors are required to sign new paperwork before January 1, 2016. Coming in Spring 2016...NCH will be starting a weekly preschool program! The Tiny Trotters program will be revamped into a new weekly program for kids 3-5 years. Details will be available in February. -Riders must arrive at least 15 minutes prior to lesson time for grooming and tacking. -Late fees will be charged for lessons, board, lease payments not made on time. -Winter is here, PLEASE dress your children in layers, hats, warm boots, and gloves for their barn time. It's always 10 degrees colder at the barn than your house! Hand warmers are a great help too! -Horse leases are available on a month to month basis, full or half leases. Thank you to all of our riders for their generous donations to the Franklin Community Center and the Hudson Mohawk Animal Shelter!!! And Thank you to everyone that attended the NCH Horse Show Series Awards Party!! We are looking forward to and planning next year's horse shows starting in April! As the colder weather approaches, NCH is gearing up for another busy season! Congratulations to the NCH IEA Team, having 3 successful shows in October!! More to come in the next few months!! NCH Horse Show Awards Party!!!! **Sunday, November 15 at 4:00pm at Harvey's in Saratoga Springs. Please send your RSVP ASAP!!!! Payments are due by November 10. If you or your child participated in any of the 4NCH home shows this year, and you didn't receive an evite, please email me ASAP for details. NCH will be giving numerous awards and recognitions to riders of all ages and abilities! *November is a month of giving, so in order to "buy" back your stirrups, riders can bring in non-perishable food items to be donated to the Franklin Community Center. IEA riders can "buy" back their stirrups by bringing in items to be donated to the animal shelter. Please confirm your lesson through the rest of the year. With the busy holiday season, please give at least 24 hour notice when you are unable to attend your lesson. November 15 * Awards party!! December 20 * Deck the Stalls!!! All riders are expected to clean up after themselves and their horse after lessons or riding. Tack put away, wash stalls cleaned, and blankets put on horse. **Lesson packages make a great gift for the holidays!! Gift certificates available! Please check out and share our web site at www.ridench.com and like us on Facebook! There is also a rider/boarder page just for NCH clients!! Summer is finally here, kids are out of school, and NCH summer camp is FULL!!! Camp starts Monday morning, we apologize for having to turn down so many potential campers, remember, camp registration starts in FEBRUARY! ALL campers should have their full registration paperwork filled out and payments paid by now. NCH has had to successful home shows so far this year, with 2 more to go! The next home show is August 9, horse request forms are available in the office, please fill out your form ASAP. *Volunteers are needed, please let me know if you are available to help out! The 4th show of the series will be September 27, with the end of year awards party in October! NCH will be participating in the Cornell Cooperative Extension Horse Farm Tour on August 1st. We will have the opportunity to show off our ReRun Thoroughbreds and the IEA Team. We hope all team members will be able to participate. IEA has sent out the July practice schedule, please make sure you have responded for practice sign ups. IEA team will hold a couple of car and dog washes, along with horse treat bake sales, on Saturdays in July!! Please consider being a patron to this month-long fundraiser for the team!! August 18, SAVE THE DATE!!! Amanda will be hosting a ReRun fundraiser at the Upstate Equine Clinic! This is a family friendly event, showcasing and raising money for our ReRun horses NCH is looking for LOTS of support for silent auction items, food and beverage donations, entertainment and ticket sales! Please consider bringing the family out to help make this event a success! If you are interested in supporting this fundraiser as a donor, let us know! Tickets are available in the office starting July 10. Adults are $40, with 16 and under, $20. **Please let me know the dates your rider will be away during the summer for vacations! Please let Amanda know you plan on going ASAP! -Sunday, February 8 from 2:00-5:00pm at Westview Apartments, 125 West Ave. in Saratoga Springs. This meeting is for all boarders, lesson students, campers and parents. Starting at 2:00 we will have all your 2015 paperwork to fill out, horse show sign ups, summer camp registrations, IEA team info and a show clothing sale/swap. At 3:00 Amanda will talk about horse show dates, proper attire and show information. *There will also be one day only discount for summer camp with registration and full payment. *Please label any clothing you are interested in sell with size, price and your name and phone number. This is a great opportunity for new and growing riders to get a head start on getting all the proper attire! February 16-20 School vacation week, a great time to add an extra lesson or two!! 2014-2015 IEA Horse Shows are wrapping up for the team by the end of February. Practices will continue, a schedule will be announced soon! The team has had a great first season, congratulations!! -Please remember when lessons are canceled, it is for the safely of horses and riders. If lessons are cancelled, so are lease rides. As NCH grows, we are always looking for ways to be better organized! We now have separate email addresses for the various aspects of our growing farm. Where you can view our monthly newsletter, download camp forms and see the horses that are for sale or adoption. And of course, on Face Book! Due to the extremly frigid tempatures game night has been postponed! Western riders do not worry NCH will be hosting there first barrel race of the series on January 25, 2015! Breaking In The New Year At NCH! It's hard to believe we are starting a new year already! Never a slow time at NCH, as always, we have lots of exciting things coming up in 2015! We hope you all had a great holiday season and are looking forward to a great 2015! PLEASE MAKE SURE ALL STALL DECORATIONS ARE CLEANED UP ASAP! The horses are eating the decorations! *ALL bills need to be paid by January 4, 2015. Amanda needs to close out 2014, any outstanding bills must be paid. IF you need to pay via credit card, please contact Liz at financial.nch@gmail or 269-6193. Late fees will be added after 1/4/2015. *Every rider, lessor and boarder is required to fill out new 2015 paperwork. Folders are being handed out by all trainers or available in the office. Please return ASAP. Lesson prices are not changing for the new year, but policies will be held. Winter Barrel Races are coming back! Registration forms are available on the board, if you are interested in competing. There are NO LESSONS on these days. The arena is closed for preparation and racing until about 4:00pm. If you would like to reschedule your Sunday lesson on these dates, let me know! *ALL lessons must be scheduled AND cancelled through Allie only, via text or email to avoid being charged for the lesson. Please remember we have a strict 24 hour cancellation policy. *Lessons must be paid for at the time of the lesson, including lesson packages. We accept checks, cash and credit cards for your convenience. Credit cards may be kept on file, at your request. In March, Amanda and Mister will be making their trip to TEXAS for the OTTB Challenge!! Anyone interested in making the trip to see this great experience, Mandy (Savanna's Mom) has found some great travel deals! She will be traveling down, and is willing to be the organizer for anyone interested in going. They will be flying Southwest, and stating in a hotel nearby, and planning to see some of the Dallas sites too! If you are interested or would like more information, please let me know and I will put you in contact with Mandy, BYJanuary 15. She figures about $400-$500 would cover the trip. ***Window clings are available in the office for $5 to help support the trip!!!! This is an amazing opportunity for Mister and all of the ReRun horses we have up for adoption! Upcoming Events: Mark your calendars!!! **It is very important, for all riders, to help to keep the barn, including wash stalls, tack room and aisles clean. Please respect, and take pride in our farm, by helping to take care of it. Parents, help teach your children to be conscientious and responsible for the amazing farm that we are all lucky enough to be part of!! NCH wishes everybody a Happy New Year! As well as our thoroughbreds a very Happy Birthday! Barrel Clinic was a Great Success! Great turnout at the barrel clinic today thank you to everybody who came! Riders remember what you learned today and take it to use in this winters barrel races! NCH wishes everybody a happy and safe New Year as we fly into 2015! We are very excited to have our barrel clinic tomorrow and hope to see a great turnout! NCH wishe's evreybody a very Merry Christmas!